This article describes what is LIB and how to download it. The Latest Internal Build (LIB) is a weekly distribution of the UI for Silverlight assemblies, built against the latest development environment. It contains all the newest bug fixes. And it is released on a weekly basis. The purpose of the LIB is to allow the users to test the latest bug fixes. So, if you have experienced any problem with the current official distributions there is a possibility that the issue has already been addressed in the latest internal build. The LIB are intended for development only and are not recommended for production purposes as these distributions have not gone through the complete QA process. Features are usually not included in the LIB. The LIB is available as a NuGet package. Read how to get it in the Installing Latest Internal Build NuGet Packages section of the documentation. Alternatively you can download the LIB assemblies from your telerik.com account. Open the Download page of your telerik.com account. 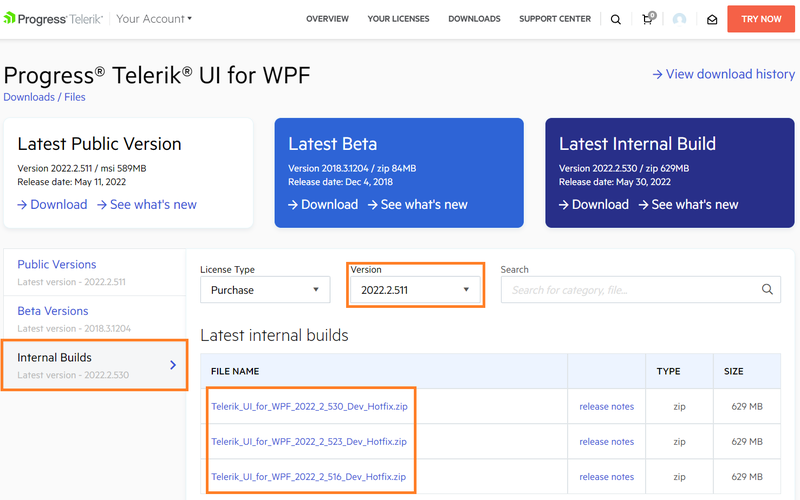 Find the Telerik UI for WPF product and open its download page. Click on the Latest internal build button. This will download an archive with the UI for Silverlight assemblies. To get a specific version of the LIB, open the Internal Bulds tab on the download page. And select a version from the list. The numbers in the name of the dlls are determined by the source code build date. In other words, the version number corresponds to the date when the dlls were built. The following image shows the name of the LIB dlls generated on 8th of April (4th month), after the R1 2019 release.